Garden level ground floor flat 60 M2 between the Mediterranean an the Eterel. Quiet location. Pleasant view of the mountains. 15 minute drive to the beaches. •	Spacious and fully equipped 60 M2 flat. •	Quiet location with a pleasant view of the Maures and Esterel mountains. •	Easy access to highways and motorways if you want to visit the country. •	Fifteen-minute drive to the beaches of Frejus, Saint Raphaël, Saint Aygulf and Boulouris. •	The house is located in a quiet residential estate with a park in which you can see the ruins of a Roman aquaduct. Beautiful view of the Maures and Esterel mountains. •	Five-minute drive to the shops and the Frejus historic town centre . •	Nearest airport and ferry terminal in Nice 65 kms, 50 minute drive. Train station : Saint Raphaël 5 km. •	A 8 motorway to Saint Tropez, Aix en Provence, Marseille or Cannes, Nice, Menton, Italy : 1 km. •	Spacious 60 M2 ground floor flat in a detached house. •	A kitchen nook with a cupboard. •	A fully equipped kitchen with a refrigerator, freezer, dishwasher, washing machine, microwave oven and cooker. •	One living room with a sofa bed for 2 people. TV. Wifi. •	A west facing tiled terrace and a garden. The owners live upstairs but have their own east facing garden so they are unobtrusive and you will be independent. They speak English and are at your disposal in case you need information or advice for your visits. Quiet. Ease of access for discovering the hinterland. Discount for long. "Nice and quiet place. Car or bike is a must to get to Frejus center or to the beach. We came for Roc D'Azur bike festival, had a great time biking in super late summer weather. "Die Ferienwohnung ist sehr schön und hat ein gutes Preis/Leistungs/Verhältnis. Die Wohnung ist sauber und gepflegt. Die Vermieter sind nett und sprechen sehr gut Englisch. Wir haben uns in der Ferienwohnung sehr wohl gefühlt. Die Lage ist günstig für Ausflüge in alle Richtungen. Die Umgebung ist sehr attraktiv und bietet durch die Nähe zum Estereil-Gebirges auch gute Erholungsmöglichkeiten abseits der großen Touristenströme. Die Anfahrt ist sehr einfach, was durch die Nähe zur Autobahn bedingt ist, von uns aber nicht als störend empfunden wurde, da es kaum wahrnehmbar ist. Insgesamt verbrachten wir in der Unterkunft und in dem Gebiet in und um Frejus einen wunderbaren Urlaub. Gerne würden wir auch ein zweites mal wiederkommen." "If you look for a quiet and calm place to stay this should be your choise. The apartment is in a quiet residential area with almost no traffic. Only the residents. The apratment has a nice garden with a gate so if you have kids you can let dem play in the garden without worrying. The apartment itself was clean and of generally good standard. The kitchen has a big fridge with a good sized freezer. But I would recommend to switch the extra fridge for a washing machine. (There is a washery at one of the super markets only 5-10 mins. by car. )Even though the tenants are living upstairs you still have your privacy in the garden. Tenants speak very good English and gave lots of good tips about where to go and what to see. Also lots of tourist info provided in the living room of the apartment. In general: Very good value for the money! Have no problems recommending others to rent the apartment." Very pleasant place to stay. 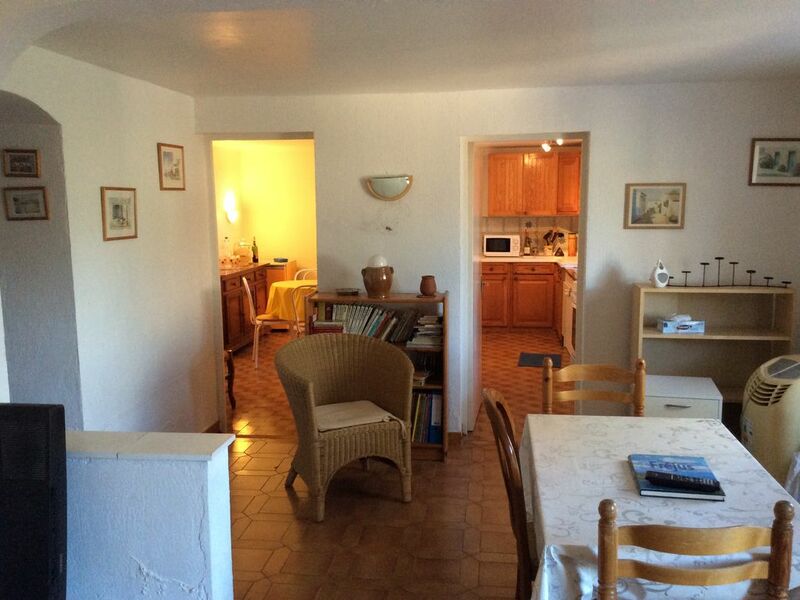 Positioned in a quiet neighbourhood with easy access to the motorway and to Frejus (an interesting town). The apartment was clean, with amenities as described. The owner was friendly, spoke good English and we had a very good, relaxing holiday. Het was een zeer aangenaam verblijf! De eigenaar is super vriendelijk! Het huisje is van alle gemakken voorzien (wifi, wasmachine, vaatwas,...). Het is een ideaal huis voor 4 personen. Ligging is ook zeek aangenaam, met de auto op enkele minuten van de zee. Wir waren schon einige male zu zweit hier wurden immer freundlich empfangen.Diesmal reichte es auch für 4 Personen Das Häuschen ist gut ausgestattet und mann kann sich sehr wohl fühlen, es ist wenige min vom Stadtzentrum und Strand entfernt und man errecht schnell das Esterel Gebirge und viele weitere Ausflugsmöglichkeiten Wir waren bestimmt nicht das letzte mal hier. (Text automatically translated) A 1 km from the exit of the motorway is Frejus.